Apparently, being locked in a lifelong struggle between the dark and light sides of the Force is really good for your pecs. 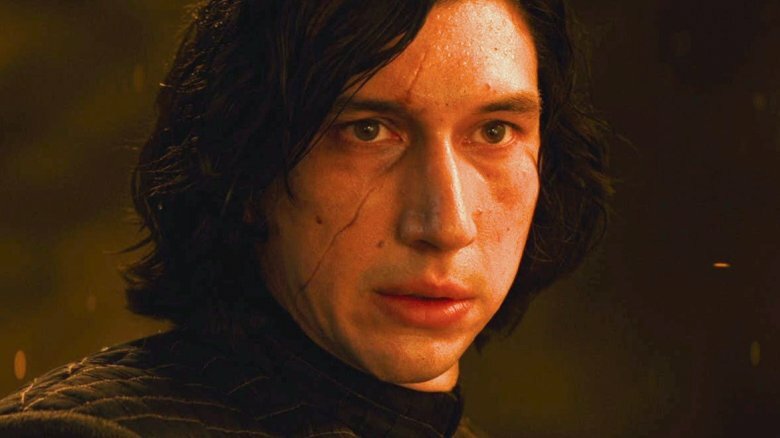 There are plenty of shocking moments in Star Wars: The Last Jedi, but one of the most unexpected occurs when Kylo Ren (Adam Driver), the conflicted son of Han Solo and Leia Organa, appears shirtless for just about no reason. It's the sort of seemingly gratuitous thing you might expect in the Marvel Cinematic Universe (remember when Gamora snuck a peek at Star-Lord while he was changing in Guardians of the Galaxy Vol. 2? ), but residents of the Star Wars galaxy rarely show much skin. Of course, there's the notable exception of that time Leia was forced into a metal bikini in Return of the Jedi. So why did writer-director Rian Johnson make such a bold, beefcakey choice? In The Last Jedi, Supreme Leader Snoke creates a Force-driven connection between Kylo Ren and Rey (Daisy Ridley). Their minds are combined into the same consciousness and they're suddenly able to see and hear each other without actually being in the same place. It's a little like the supernatural romance in 2014's In Your Eyes. It's during one of those mind melds that Rey catches Kylo Ren shirtless. "I'd rather not do this right now," she says. "Yeah, me too," he replies. If it happened on an episode of The Big Bang Theory, there would be a laugh track. But nothing in Star Wars happens by accident (except maybe Jar Jar Binks), and Kylo is half-naked for a reason. There's a theory that it references Anakin Skywalker (Hayden Christensen) in the prequels. He's the only other character to appear shirtless in Star Wars and he did it twice: once in Attack of the Clones and again in Revenge of the Sith. However, it's actually a little more straightforward than that. Sound supervisor Ren Klyce told HuffPost that Kylo Ren is shirtless to prove to the audience that Rey can actually see him. "The way in which [director Rian Johnson] decided to create the Force connection [was] by just simply doing vertical cuts without using any CG… it's pure simplicity in terms of filmmaking with visual cuts. We cut to her side; we cut to Kylo Ren; we cut to her; and back and forth," Klyce explained. "[Kylo Ren being shirtless] was important to establish what she was actually seeing. Was she hearing his voice or seeing his face or just his eyes? And so that [shirtless scene] is to inform the audience, 'Oh, she can see his body… it's also good humor." Editor Bob Ducsay reiterated that the moment serves a purpose. "Over the course of those sequences, you come to understand all the rules of [the Force connection]," Ducsay said. "Ultimately, it's just good storytelling if the audience is learning things the same time the characters they're following are, instead of ahead or behind." So there you have it. There's a perfectly rational reason for the wardrobe choice. But it does bring up another question: How much does the First Order charge for gym memberships? Do they have tanning beds?